In March, 1887, Albert C. Ludlum (1867-1928), a young clerk in the Federal National Shoe & Leather Bank of the City of New York, applied for a patent for Adding and Writing Machine. The patent (No US384373), was granted in June, 1888, then in 1891 the patent was reissued (pat. No USRE11147). 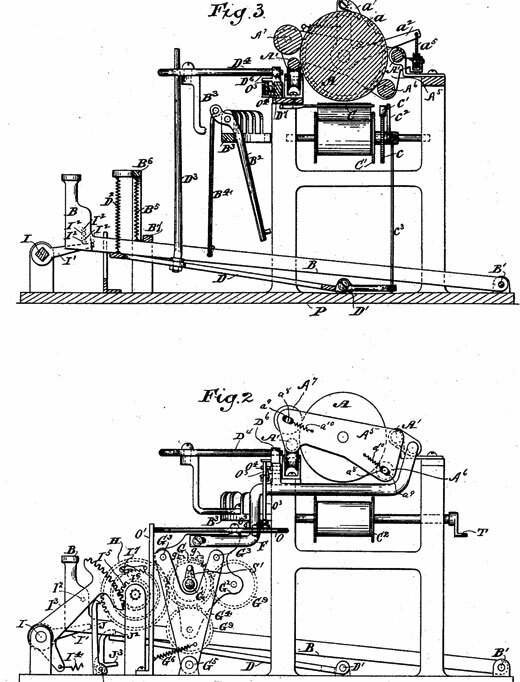 The machine of Ludlum was mentioned in the patent of William Hopkins (pat. 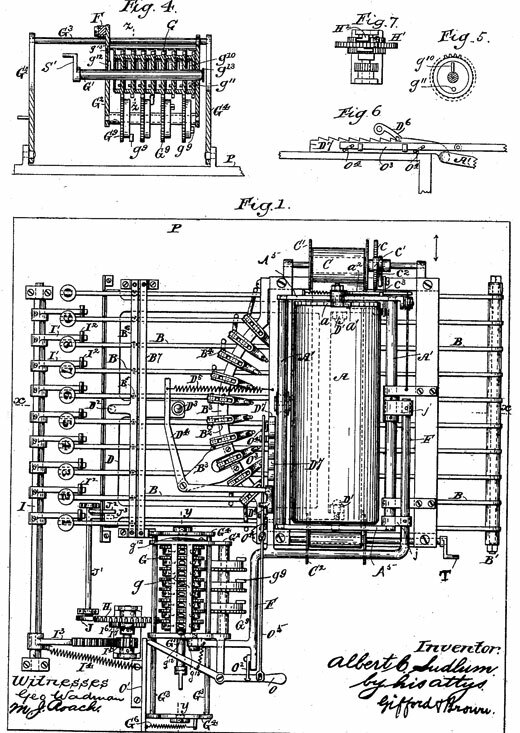 No US517383 from 1892) as the first machine with a carriage, or travelling member, which moves automatically from order to order as the numbered keys are operated. The machine of Ludlum was essentially a typewriter with an adding mechanism attached. Let's examine the device, using the patent drawings (see the both sheets with drawings below). A series of numeral wheels and their devices for machine the transfer of the tens, designed to register the totals, are shown mounted in a shiftable frame connected with the bar marked F, with the typewriter carriage, and is claimed to move therewith. Each numeral wheel is provided with a gear marked G, which, as the carriage moves after writing or printing each figure of the item, is supposed to slide into mesh one at a time with an adding gear marked H, the engagement taking place from right to left. Or beginning with the right or units numeral wheel a higher order numeral wheel gear is supposed to shift through movement of the carriage into engagement with the adding gear H, each time a key is depressed. The adding gear H, is supposed to receive varying degrees of rotation from the keys according to their numerical marking and to rotate the numeral wheel with which it happens to be engaged, a corresponding number of its ten marked points of registration. Between the adding gear H, and the keys which act to drive it, is a ratchet and gear device consisting of the ratchet pawl pivoted to the adding gear H, the ratchet I6 and its pinion gear, the segment gear I3 fast to the rock shaft I, the nine arms I1 fast to the rock shaft and the pins I2, which are arranged in the key levers to contact with and depress the arms I1 of the rock shaft varying distances, according to the value of the key depressed. That is, supposing that the full throw of the key-lever was required to actuate the rock shaft with its gear and ratchet connection to give nine-tenths of a revolution to the numeral wheel in adding the digit nine, the pin I2 in the (9) key-lever would in that case be in contact with its arm I1, of the rock shaft, but the pins I2, of each of the other key levers would be arranged to allow lost motion before the pin should engage its arm I1 of the rock shaft, in accordance with the difference of their adding value. According to the specification, Ludlum evidently had the idea that he could stop the adding gear H, while under the high rate of speed it would receive from a quick depression of a key, by jabbing the detent J between the fine spacing of the gear teeth shown in his drawing. The principle is working, but it is not implemented properly by the inventor. The detent lever J, as shown in the drawings, is operated by the hinged plate D, through action of the key levers, as any one of them are depressed. Under depression of a key, the hinged plate D, being carried down with it, engages the arm J3 of the detent and throws the tooth at its upper end into the teeth of the gear H.
The timing of the entry of the tooth of the detent is supposed to be gauged to enter the right tooth, but as the action of these parts is fast, slow or medium at the will of the operator, considerable time must be allowed for variation in the entry of the detent tooth, which requires space, as certain parts will fly ahead under the sudden impact they may receive from a quick stroke, where they would not under a slow stroke, but no allowance was provided for such contingency. The means provided for the carry of the tens consist of the gears G9, meshing with the numeral wheel gears and the single gear tooth g9, attached to it, which, at each revolution of the lower wheel, as it passes from 9 to 0, engages the gear of the numeral wheel of higher denomination and was supposed to turn the higher gear one-tenth of a revolution, thus registering one greater. On account of the gears G9, of one order and the gear tooth g9, of another order operating on the same numeral wheel gear, the transfer gears are arranged alternately on separate shafts, one at the side and one below the numeral wheels. As a bottom line, the drawings and specification of the Ludlum patent disclose a daring scheme and the imagination of the inventor, but the means provided for transferring the tens without any control for the numeral wheels against over-rotation, would make correct addition impossible. Who was Albert C. Ludlum? Albert Claude Ludlum was born on 13 May, 1867, in Brooklyn, New York, to William Henry Ludlum (1836-1912), and Mary Ann Kellum Ludlum (1838-1911). Ludlam (later Ludlow and Ludlum) family were descendants of the early settler William Anthony Joseph Ludlam, (born 1628 in Matlock, Derbyshire, England—died 13 June 1667, Huntington, New York), who moved to the New World in July, 1648 (William and his sister Grace were passengers on the ship "Trail" from Matlock, Derby, England, to Boston). William Ludlam settled in Southampton, Long Island, New York, where he in 1652 purchased the local mill and Ludlam family were the millers of Southampton for several generations. Albert Ludlum was educated in the public schools of New York, and in 1886 he was engaged as a clerk in Federal National Shoe & Leather Bank of the City of New York. In 1889 he joined as a clerk Kennedy & Pierce Company of Denver, Colorado, manufacturers of mining machinery. Ludlum later established the New York Engineering Company, a manufacturer of mining and other heavy machinery, in Yonkers, New York. Besides the two above-mentioned patents for calculating machines, Albert Ludlum was a holder of many patents for mining machinery (suction elevator, drills, dredge, etc.). Albert Ludlum married in 1890 to Edith F. Ludlum (b. Sep 1871), but they didn't have children and later divorced. In 1916 Albert Ludlum married second time to Frances Ludlum (b. 1894). Albert Claude Ludlum died on 15 February, 1928, in Manhattan, New York, and was buried in Prospect Cemetery, Jamaica, New York.